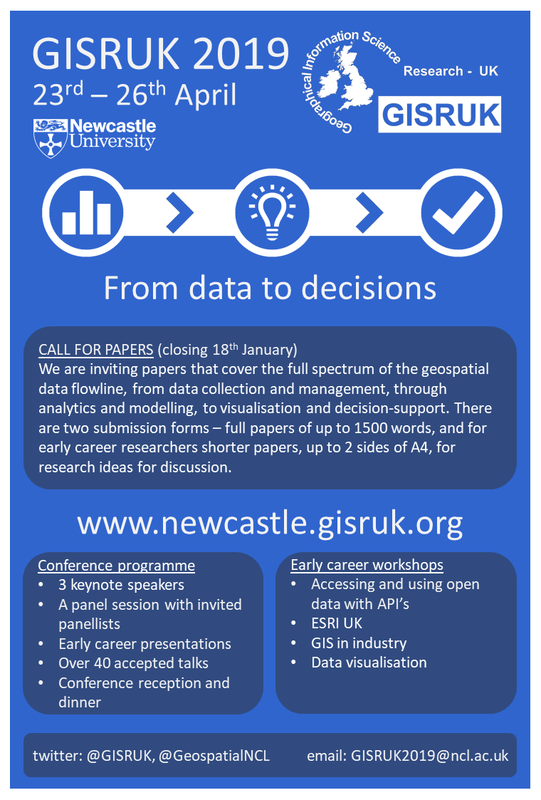 In what is the week of #gisday we can now announce that that registration for GISRUK 2019 is now open – see our website for prices and a link to register! (Prices start from £150). 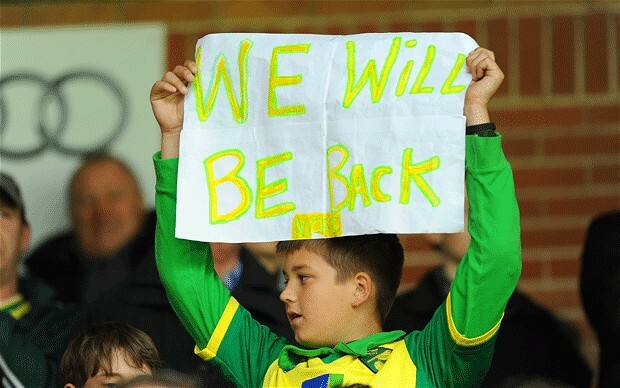 And we have announcements lined up for later in the week too! Alongside registration we have also opened up the application process for our early career scholarships which we are offering to eligible candidates. To be qualify you must be a lead author on a submission, be a student (masters or PhD) or an early career researcher (with less than 3 years experience). For more details, and to apply, see our website. If you missed our call for papers, announced on the 9th October, there is still plenty time to get your submissions in with the deadline being the 18th January. We have already had a few submissions, so if you want more information, there is details about this years call on our website. (We also have a flyer if you want to help spread the word A5 or A4). More details about our keynotes will be announced very shortly – the first hopefully this week! Author CraigPosted on November 12, 2018 December 7, 2018 Categories Conferences, EventsLeave a comment on GISRUK 2019 – registration open! In April, I submitted a Story Map to Esri UK titled ‘Geovisualising Environmental Impact Assessments’; this explored the work I completed in my undergraduate dissertation and how this led on to my current PhD work. When I received the call that I was successful I felt a whole series of different emotions – excited, nervous, motivated, and overwhelmed. But, nevertheless unbelievably eager to be one of the 16,000 attendees at the 2018 Esri User Conference in San Diego. I am going to tell you my top five moments I had whilst attending the UC. The Plenary was followed by the Map Gallery, which was the third stand out moment in my time at the UC. This provided an opportunity for me to show the poster I submitted along side the other Young Scholars, interact with other attendees to discuss my work and look at 100’s of stunning maps submitted to the Map Gallery. 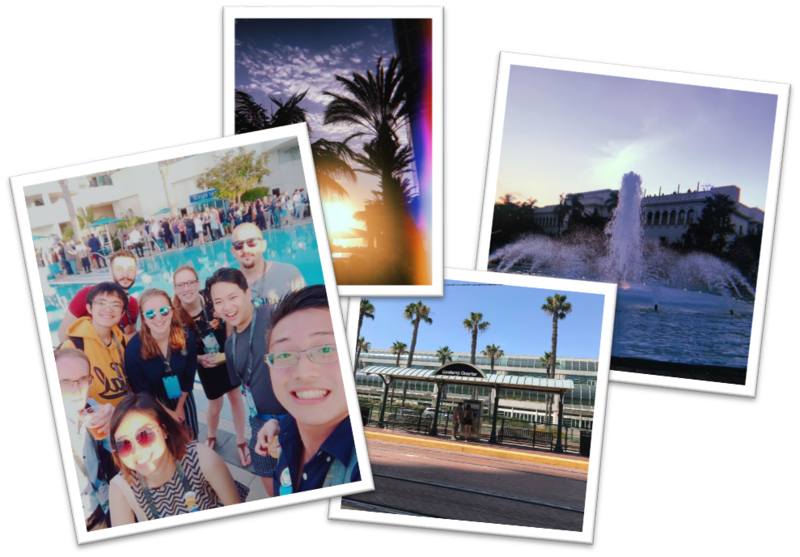 This was a fantastic networking opportunity, I spoke to people from all over the world about my work (and gaining some great connections on LinkedIn). 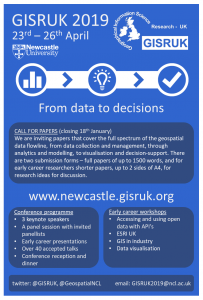 As well as chatting about the GIS education I received at Newcastle University and my PhD program through the DREAM CDT. As well as all the fantastic academic and informative opportunities, there were some great social events that were my fifth stand out moment. The Young Professionals Network (YPN) allowed for interaction with young GIS professionals from around the world. It was interesting to meet a wide variety of people in a fun and fresh environment. There was great upbeat music, food and company! On the Thursday night, a party was held at Balboa Park; which was massive. The park contains a variety of museums, all open for free – with music, drinks and food from different areas of the world. It was great to explore with the fellow young scholars, with a good dance at the main stage – ending the week perfectly. 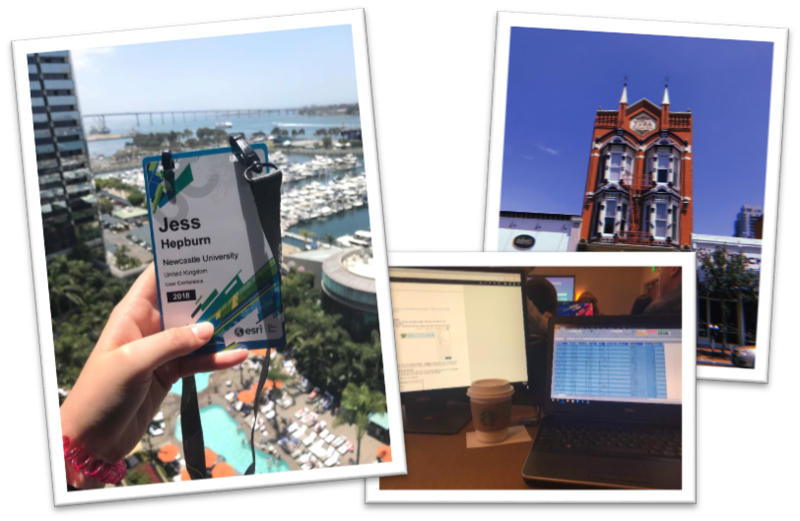 Overall, I had a once in a lifetime experience in San Diego at the Esri UC, it opened my eyes to so many new possibilities and demonstrated how highly GIS is regarded across the world. I would like to thank Esri UK for this fantastic opportunity and would recommend anyone to apply! 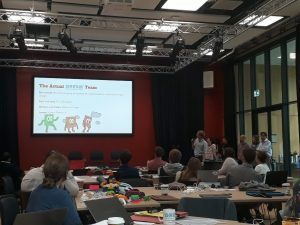 Last week we hosted the DREAM CDT (Centre for Doctoral Training in Data, Risk And Environmental Analytical Methods) Challenge Week – an event each year, which brings together the students from across the four member universities to address a set challenge based around the themes of the CDT – big data and environmental risk. 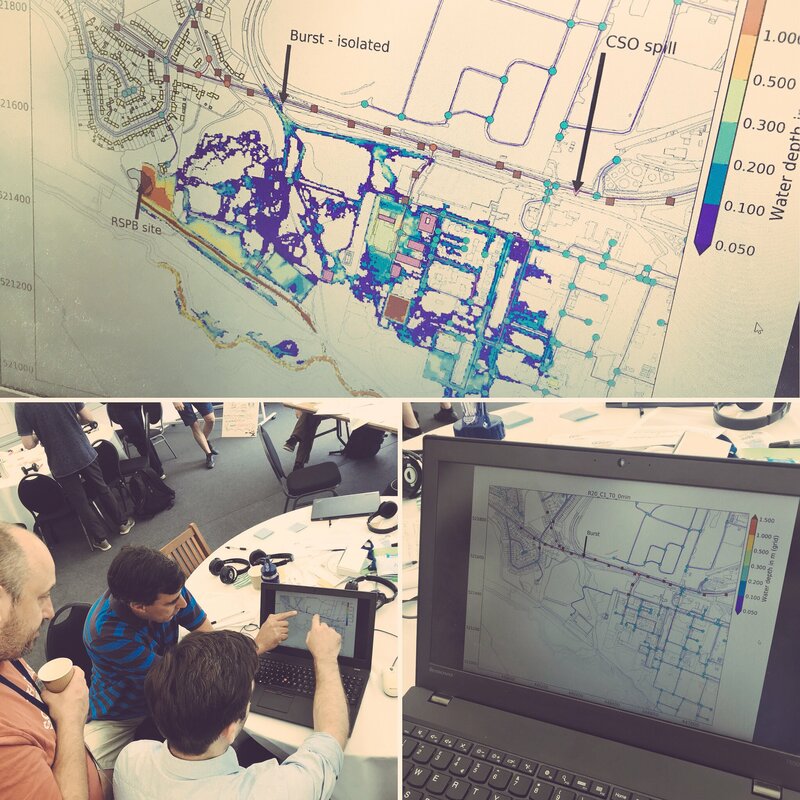 This year the students were asked to ‘design and undertake an agile prototype development of a real-time spatial hazard decision support tool for Newcastle-Upon-Tyne’. Data from both the Urban Observatory and the NISMOD-DB++ (National Infrastructure Simulation and Modelling Database) was made available, as well as technical advice from staff in both teams (all part of the Geospatial Group) on accessing and using the data through their API’s. Urban Sciences Building, Newcastle University. The host venue for the week. Group 1 – Investigated how real-time temperature data from the Urban Observatory, combined with historical data, could be used to alert emergency responders/decision makers/residents/family members of those locations where action was required when extreme temperature events appeared to be occurring. By using household characteristics data from the NISMOD-DB++ database, those communities which might be more vulnerable could be identified improving the effectiveness of the system. Group 2 – Using real-time air pollution data from the Urban Observatory and Ordnance Survey road network data from NISMOD-DB++, the group designed and demonstrated an app which allows users to identify a route between destinations based on the exposure to air pollution and/or time. 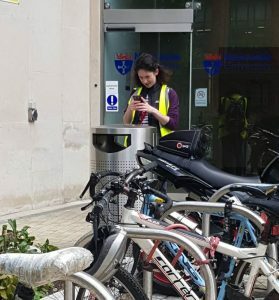 Ordnance Survey building heights data was also used, again via NISMOD-DB++, to improve the estimates of pollution levels on streets where no sensor data was available. Group 3 – Like group 2, an app was developed to allow users to identify the least polluted routes between two locations, though this was focused on school children and had an educational element too. A user friendly interface was designed with the aim of encouraging children to learn about the harmful effects of pollution, and help identify routes from their homes to school that can help reduce their exposure risk. Again this used real-time data from the Urban Observatory as well as Ordnance Survey building and network data through NISMOD-DB++. 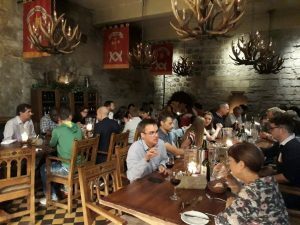 As ever, such events also involve a team bounding exercise, and on this occasion, this was a meal out in Newcastle at the Blackfriars restaurant on the Wednesday evening. With Newcastle being known as a bit of a party city, I will let you decide if the night stopped there on went on a little later into the night…. Thanks to all the students who came along and actively enagaged embracing the set challange, to all presenters for giving up thier time, and to all staff from across the four universities who attended, all of which made the event a success! The Mapping the World project last week saw 15 year 10 and 12 students from 4 local schools experience University life as a Geomatics student. Students were introduced to the world of geospatial engineering and learnt about how GIS is used in their everyday life (think snapchat maps), and how to measure height change of land using levelling. The hi-vis jackets (or wally jackets as we like to call them) proved very popular with the flies on Exhibition Park but not so much with the students wearing them! 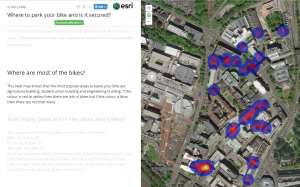 Using ArcGIS Online and the Survey 123 app students investigated how GIS can help with asset management around Newcastle University campus. 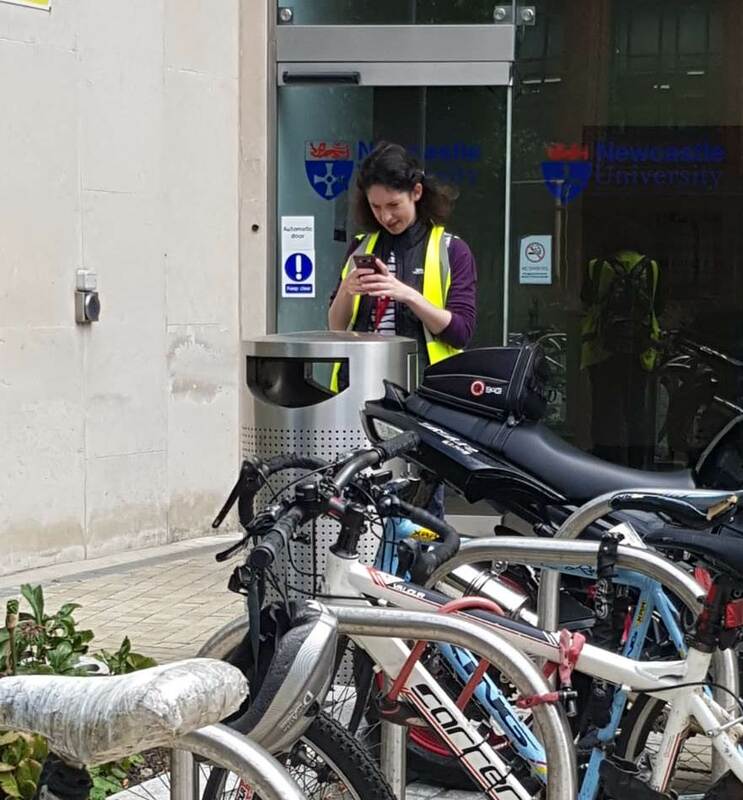 Students were given free rein on which aspect of campus management they would like to investigate, projects covered everything from where to store your bike, where are the comfiest seat on campus and disability access routes. After exploring the campus whilst mapping, students concluded by presenting their findings using Story Maps to show off all their hard work. It was great being part of the Futureme programme inspiring the next generation to go into higher education. 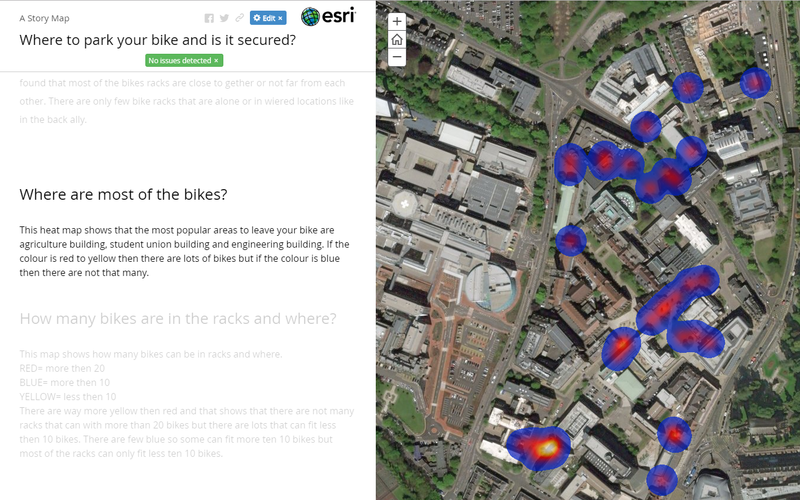 A heatmap of bike storage locations and there popularity, one of the many maps produced by the students with their own data. Last week myself and a group of us attended the Northumbrian Water Group (NWG) Innovation Festival (#InnovationFestival18), intended to bring people from different areas together to think about and tackle challenges within the water industry (with a focus on NWG). More intriguingly Newcastle University had sponsored one of the 12 sprints, a sprint running all day for the full five days with the idea of developing concepts to solve a problem, with this in particular sprint focused on digital twins (#DigitalTwins). Other sprints included how utilities could better work together to map underground assets and one focused on how can we create a happier and more productive workforce. This was not a small event, with over 2000 people attending and over 500 business involved. In true festival style, the week began with a compulsary participation in a sing-along to ‘The greatest showman’….. Crowds in main tent (the ‘Thunderdome’) to see guest Alexander Armstrong (of pointless fame). 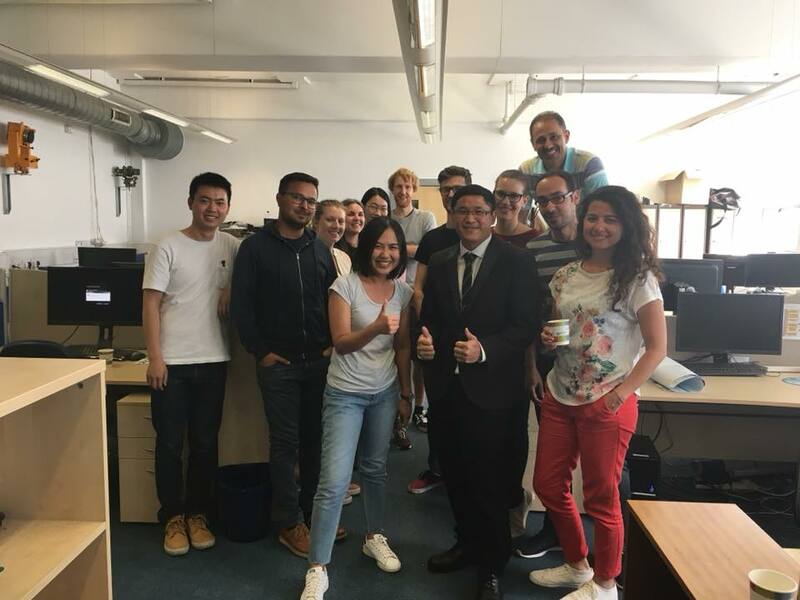 Great ideas were bounded around, with people involved ranging from those in management positions in NWG, to researchers like myself all who had varied skills and interests, to NWG customers themselves! Ultimately in the Digital Twin sprint where we were most involved, great ideas were devised as to how these could help NWG, from devising a single database system as ‘a single source of truth’ to developing a digital twin for incidents such as bursts as well as one for the whole company for modelling the communication and data flows through personnel. I’m sure across the other 11 sprints more great ideas were involved, with NWG now left with the not so small job of deciding which of these to follow up on! Work on a #DigitalTwin of a pipe burst which occured a couple of months earlier on the NWG network. 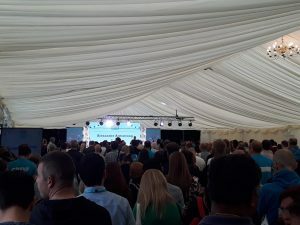 For more information see https://innovationfestival.org/. Thanks to all the effort of the organisers! 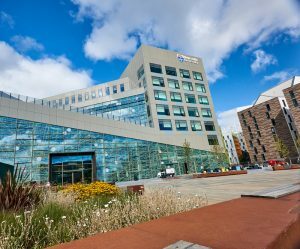 As part of Newcastle University’s ‘Inspired by’ Great Exhibition of the North programme, Dr Maria-Valasia Peppa from the School of Engineering and NEOlab, will be discussing some of her work investigating changes in our cultural heritage. Cultural heritage has large historical, social, and anthropological values and is an important enabler of sustainable development. 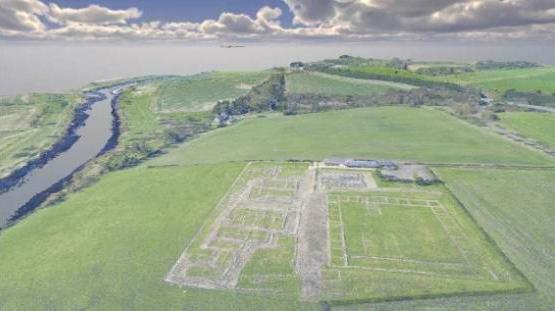 Join researchers at Newcastle University in exploring how technologies, such as remote sensing and 3D printing, are used to safeguard the world’s cultural heritage for future generations. The event is free to attend, however you need to register here. The event is on the 26th July at 1 Science Square, and will start at 7pm.